Byung-Kook Kim graduated from Harvard University with B.A. in Economics and Phi Beta Kappa in 1982 and with Ph.D in Political Science six years later. At the Department of Political Science of the Korea University, Dr. Byung-Kook Kim currently teaches party politics, methodology, and comparative political theory. He served on the Editorial Board of Hankukilbo (1994-1995) and the Presidential Commission on Policy Planning (1994-1998), and taught at John F. Kennedy School of Government, Harvard University (2003) as Ralph I. Straus Visiting Professor. 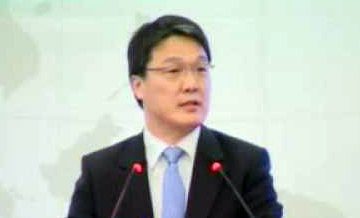 Mr Byung-Kook is also the director of The East Asia Institute, a private non-profit organization founded with the goal of transforming East Asia into a society of nations based on democracy, market economy, open society and peace. He also serves on the editorial board of Journal of East Asian Studies, International Political Science Review, and Pacific Affairs. His published works include The Dynamics of National Division and Revolution: The Political Economy of Korea and Mexico (1994); State, Region, and International System: Change and Continuity (1995); Korean Politics (1998); and Consolidating Democracy in South Korea (2000).